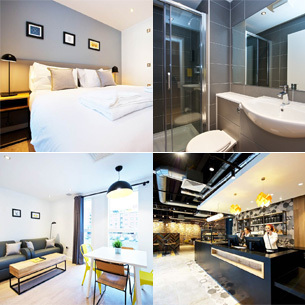 Construction of the GWP 170 room aparthotel scheme at Newhall Square in Birmingham’s historic Jewellery Quarter for StayCity is now complete and open for business. GWP worked alongside RO Real Estate and Elias Topping to deliver a challenging project that involved the building having to ‘wrap’ around the Grade II-listed Whitmore Warehouse and front onto the Birmingham and Fazeley Canal. The aparthotel includes a selection of studios and one and two-bedroom apartments all equipped with kitchens and en-suites. StayCity already has over 1,000 apartments across eight European cities and is currently aiming to add circa 5,000 apartments over the next five years.